Negative reviews aren’t the end of the world, but most business owners would like to avoid them altogether. #1. Hire the right team. As the owner or manager of a company, you have a lot of say in the direction of the company and in many other areas of operations. However, you probably don’t have a lot of contact with customers. Your staff, however, is constantly interacting with customers, and if the people on the front lines aren’t providing customers with the proper respect or doing their due diligence, it reflects poorly on your whole company. The first step toward eliminating or avoiding negative reviews is to ensure that you have the right team on your side. #2. Stay up to date on training. Maybe no other company can compete with your team’s friendliness or customer service, but it’ll be all for naught if your team doesn’t know what they are doing or aren’t properly trained to get the job done. There are so many companies in any given industry that no business can afford to let themselves fall behind the times. Ensure that you stay up to date on all new advancements in your industry and keep your staff up to date by providing ongoing training. #3. Make customer service a priority. In this day and age, businesses are often competing against other businesses that offer similar products and services for roughly equivalent prices. That means that, in order to stand out in this ultra-competitive business environment, your customer service has to be at the top of its game. Even if it means taking longer on a job, losing out on additional work or even losing money, taking the time to provide great customer service will lend itself to lifetime customers and referrals, which are both huge for your business’ growth and long-term success. #4. Address issues as they come up. Don’t wait until a customer is so upset about their experience that they take to Google or Yelp to tell the world about how awful you are to work with. Instead, take a proactive approach and address issues as they come up. As the business owner or manager, you may not know when an issue comes up, but it’s important to stay in contact with your customer-facing staff, as well as your supervisors and management. Any time a staff member believes a customer is unhappy or unsatisfied, make sure they know to tell you. You need to know about any issues that come up so that you can help to resolve them and make them right before they turn into full-blown problems. #5. Learn from previous mistakes. If you’re reading this article, chances are, you’ve dealt with negative reviews in the past and you’re looking to avoid them in the future. However, there’s a lot of value in the negative reviews you have; you just have to take the time to fully listen to what they say and learn from them. The possibility is strong that, if one customer experienced a problem, other customers will experience that same problem in the future if it’s not dealt with. Always read any negative reviews you have, take them to heart and figure out ways you can do better in the future. #6. Be mindful of your customers’ perspective. 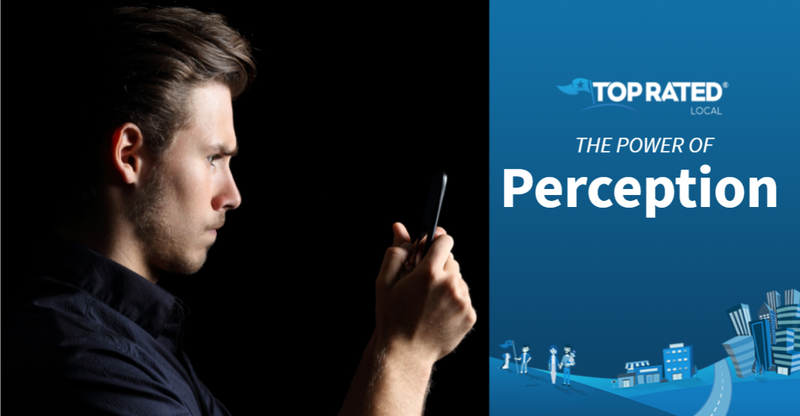 In a previous blog, we talked about the power of perception in reputation management. You’ve probably heard the saying, “Perception is reality,” before, and it’s never been more true than it is today for business owners. Whether or not their perception is accurate, it’s reality for your customers. So even if the job took three additional hours because something unexpected came up that needed to be fixed or because you took the time to go above and beyond your duty, if you don’t communicate properly with your customers, all they will know is that the job took longer than you told them it would, which brings us to our next point. #7. Communicate with your customers! A lot of businesses make the mistake of believing that their customers won’t understand why they do things a certain way or why things may take longer than originally thought. However, it’s up to you to explain the situation to them in a way they can understand it. Staying in constant communication with your customers is important for so many reasons. For one, they are paying you for a product or service, and therefore, they have a right to know what’s going on. Furthermore, you can avoid misunderstandings and miscommunication that can make you lose out on customers or business if you keep your clients in the loop about what’s going on. #8. Collect feedback about your business regularly. Keep feedback cards handy for your customers. Talk to your client-facing staff about their interactions with customers. Ask your customers directly about their experience. #9. Make it easy for customers to reach out to you. A lot of times, customers will write a negative review because they feel like no one is there to hear their complaints or about their negative experience. That’s why it’s important for your customers to be able to air their grievances and be heard at any point in the transaction, not just at the end when all is said and done. Give your clients your email address or phone number so that they can alert you when something goes wrong. Or, add a form on your website so that customers can let you know about issues as they come up. #10. Don’t let your pride get the better of you. We all make mistakes and none of us are perfect human beings. Don’t be so confident in your services or products that you are unwilling to accept that you make mistakes or are sometimes inconsistent in your service. Instead, accept that mistakes happen, learn from them and then use what you’ve learned to truly become the best in the business. 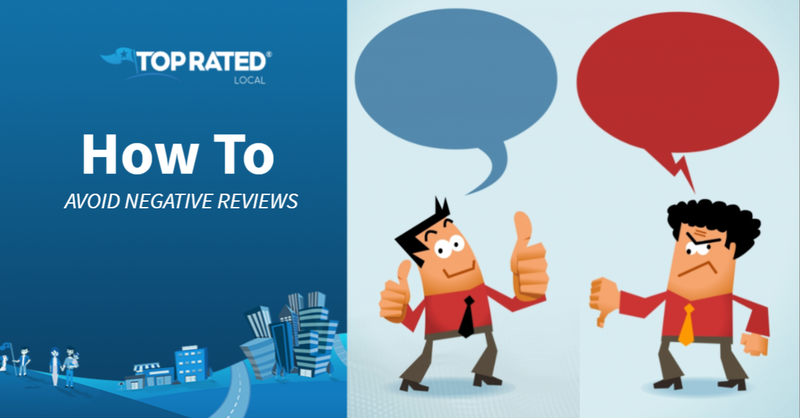 Turn negative reviews into positives for your business with Top Rated Local. There are lots of things you can do to avoid negative reviews, but at some point or another, you’re probably going to get one. Don’t let one negative review be the downfall of your business! Respond to negative reviews and take ownership of your online reputation by signing up for Top Rated Local today! It’s free to get started, so you have absolutely nothing to lose! Does a negative review mean the end of the world for your website’s organic rankings? You work hard on your website’s search engine optimization (SEO) in order to improve its organic rankings and gain more visibility online. After all, if your business doesn’t show up on the first page of the Google or Bing search results, it may as well not exist, as most people don’t look past page one for local businesses. But take heart, as bad reviews won’t necessarily undo all of the time and energy you put into building your website’s SEO; in fact, they may actually help. #1. They increase the overall number of reviews your business has. When you look at a business’ profile on Google, not only does it show the average star rating of the reviews, but it also shows the number of reviews a business gets. The good news is that the more reviews you have, even if they’re not all five stars, the more visibility your website will get. Furthermore, consumers pay attention to the number of reviews a business has when they’re doing their research. Choosing to work with a business that has a five-star average but only three reviews is a gamble for consumers. With so few reviews, consumers can’t get a real idea of the service provided. But if a business has a three or four star average with hundreds of reviews, consumers are more likely to trust them because they are able to learn about many different people’s experience with the company. Most people aren’t going to read every review that you have in any event. They just want to gain a good understanding of the kind of service you provide for your customers, and the more reviews you have, the more trust it instills in prospective customers. #2. They give you more credibility. According to the Journal of Vacation Marketing, consumers believe that negative reviews are more credible than positive reviews. This may be why consumers often get suspicious when a business only has five-star reviews. In large part, customer service isn’t what it used to be, and to consumers, reviewers who are unbelievably happy aren’t all that believable. In fact, when consumers are researching businesses and determining if they are trustworthy or not, they’ll often look for a business that has a solid mix of positive, moderate and negative reviews. It stands to reason that the increased credibility that comes from negative reviews could actually lead to more people visiting your website, therefore increasing your websites click-through-rate, increasing the amount of time people spend on your site and improving your website’s SEO value. #3. They give consumers an accurate picture of your business. Negative reviews not only give your business more credibility and build trust in potential customers but they also help to give them a more accurate picture of your business, which, at the end of the day, is what all consumers are looking for when they research a business online. Cathy is searching for a new set of free weights and a bar online. She finds two different options in her price range to research further, both of which have around 300 reviews with an average star rating of four stars. Cathy decided to read the negative reviews for both products. The negative reviews on the first product say that there’s a strong chemical smell, and the negative reviews on the second products say that the weights fall off the bar or that the bar breaks. Obviously, most people are happy with the product and if there is a defect, a chemical smell is a much smaller risk than a breaking bar or falling weights, so Cathy is more likely to choose the first product. Negative reviews provide prospective customers a glimpse into what kind of service you provide, and how you respond to them speaks even more to your service. #4. Responding to them makes your business even more credible. Responding to negative reviews is one of the smartest things you can do as a business owner. If you don’t respond to negative reviews, reviewers can say whatever they want about your business without recourse, and there’s no way for prospective customers to know if the review is accurate or not. However, when you respond, you’ll be able to correct any misunderstandings — in a professional way of course. It also gives you a chance to show off your customer service prowess. Not only can you win back customers who have had bad experiences with your business by responding to reviews, but if you show prospective customers that you’re willing to own up to your mistakes and make them right, you’ll earn their trust as well. Taking the feedback to heart will also give you a chance to adjust things about your business that may be hurting your customer service or the quality of the service you provide. This will help you to improve the experience you provide for your customers, which will lead to an increase in reviews and greater online visibility for your website. #5. They help you produce better content for your customers. Reviews, both negative and positive, give you insight into your customers’ thoughts and feelings, but this is especially true for negative reviews, as customers tend to be more honest when they are upset. When you’re reading negative reviews, ask yourself what you could have done differently to make the customer happy, what promise your service failed to keep, what questions your customers have about your service, what your customers don’t understand about your service and what search phrases and terms could help prospective customers find your website in the future. All of these questions could be used to guide the content in your social media posts, blog posts, Youtube videos and more. For example, if you are a restaurant owner or manager, and someone has complained in a review about how long it takes for the food to come out. Write a blog all about how you make everything from scratch and about the time and energy that goes into making artisanal meals. 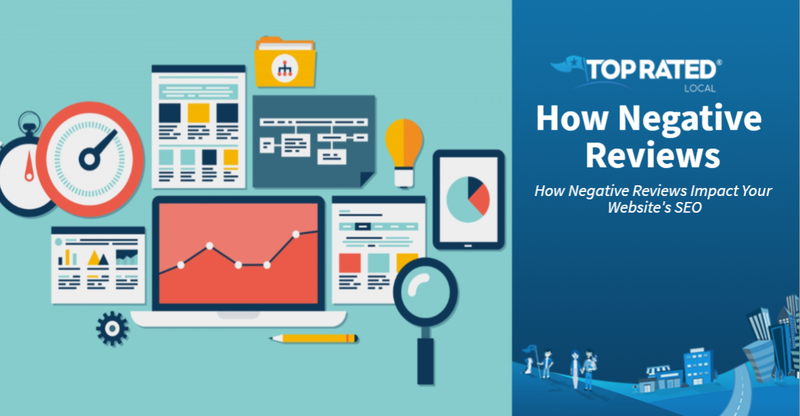 Negative reviews don’t have to hurt your website’s SEO; in fact, they are probably helping it. However, that doesn’t mean that you should let negative reviews go unchecked or pretend like they don’t exist. If you have 500 reviews with an average rating of one star, it’s not going to help. Taking a proactive approach to managing your business’ online reputation is essential, and that’s true regardless of the industry you are in or the size of your business. Luckily, Top Rated Local is here to help, and even better, it’s free to sign up! Get started today. 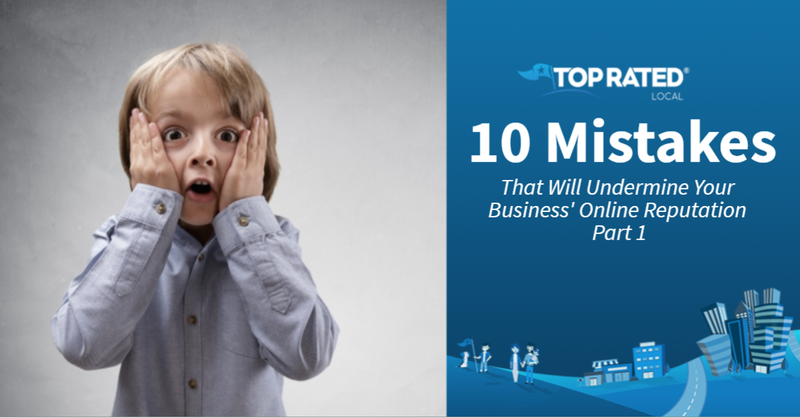 Don’t let common mistakes derail your business’ online reputation! Mistake #7. Ignoring bad reviews. Review platforms, like Google and Yelp, give customers an opportunity to air their grievances in a much more public way than ever before. So no matter how small or unfair a complaint may be, the entire world is going to see it when it’s posted online in the form of a bad review. Though bad reviews may seem like a hopeless problem to some business owners, they actually give you a great way to show off your customer service skills. Your response, like the review itself, is public. So not only can great customer service help to turn around an individual customer’s bad experience, but it could also help you win over new customers as well. If you ignore negative reviews, on the other hand, you’re only hurting your reputation even more. Mistake #6. Failing to learn from negative feedback. There are occasions when negative feedback is completely unjustified, like, for example, when a disgruntled ex-employee trashes their old employer online by pretending to be an unhappy customer. However, the vast majority of negative reviews are from very real customers, and chances are, you can learn a great deal from the feedback they are providing you with. If you want to provide the best possible service for your future clients, you need to learn from past mistakes, which are often pointed out in bad reviews. Mistake #7. Not responding or highlighting good reviews. 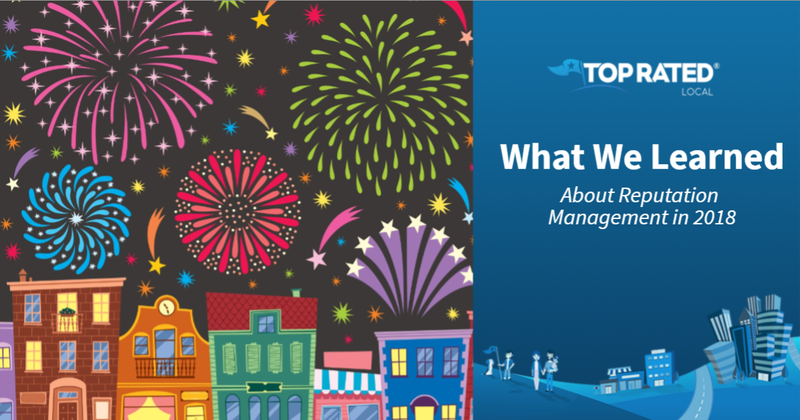 A lot of business owners see reputation management as damage control, which has a very negative connotation. And while, yes, managing and responding to bad reviews and negative press is certainly a part of reputation management, it’s just as important to highlight the good things about your business. When a customer leaves you a positive review, it’s important to thank them for taking the time to do so, and it doesn’t hurt to brag a little about your achievements either. Good reviews can be posted on your website, social media accounts and beyond. Not only will this help to earn the trust of new customers, but it will also show your existing customers how much you value them and their feedback. Mistake #8. Responding to reviews unprofessionally. Some business owners are operating under the false assumption that any response is better than ignoring a review, but you should know that there’s a right and a wrong way to respond to reviews. Whether you’re responding to a positive review or a negative review, you should always do so in a professional manner. This is especially true when it comes to negative reviews, as it’s all too easy to respond defensively when you feel that your business is being unfairly attacked. Whatever you do, always remember that you are responding publicly and that prospective customers will be judging you on how you do so. With the right kind of response, a negative review can help to showcase the next-level service you provide, but the wrong kind of response can make you appear petty and vindictive. Mistake #9. Using your business to voice personal opinions and views. There are more than seven billion people living on the earth today. There are also thousands of religions and different languages, and many different cultures, political leanings, etc. The point is that the world is an incredibly large and diverse place, and these days, people can often take differences of opinion to heart. As a business owner, it’s important to remember that. Too many business owners have used their business as a platform to voice their own personal beliefs and opinions, only to end up damaging the business they’ve worked so hard to build. When you’re dealing with such a vast, diverse audience, playing it smart by keeping things professional is the best way to go. Mistake #10. Not publishing content on a regular basis. Controlling or at least guiding the conversation is the biggest and most important part of reputation management online, but you can’t do that if you don’t put your own content out there. There are so many types of content that can help you control your online reputation, including review responses, social media posts, blogs, press releases, Youtube videos and so much more. Posting content regularly shows off your customer service skills and allows you to steer your reputation in the direction you choose, and it also helps to force negative content about your business lower and lower in the organic search results, reducing its visibility. Building your business’ online reputation takes time and effort; don’t let an avoidable mistake undermine all of the hard work you’ve put into it. Sign up for your free Top Rated Local account today to start taking control over your business’ online reputation. These days, a business’ online reputation means everything. Mistake #1. Failing to monitor your online reputation. How can you possibly know whether your business’ online reputation is working in your favor or not if you don’t monitor it? All it takes is one bad review or negative article to damage all of the hard work you’ve put into building your online reputation. When you monitor your reputation and are in the know about any blogs, reviews, social media posts or anything else that may hurt your reputation, you can take steps to resolve them. However, if you don’t monitor your online reputation, there’s no way to be proactive about negative information online, and it could cost you. After all, your business’ online reputation won’t take care of itself. Mistake #2. Allowing bad reviews to go unchecked. We are all human and, therefore, capable of making mistakes, which means that even businesses that provide their clients with top-tier service 99 percent of the time will sometimes drop the ball, and when that happens, clients may go online and leave a bad review. The fact is that people are much more likely to review a business they are unhappy with than one they had a good experience with, and all it takes is one negative experience. However, even if you provide perfect service every minute of the day, an ex-employee with a grudge or someone else may leave a bad review. Regardless of the situation though, a bad review is a great opportunity to show off your customer service skills, but the catch is that you have to respond publicly to show both the client and the rest of the internet that you’re ready to make the problem right. If you don’t respond, you can’t control the situation; it’s as simple as that. Mistake #3. Not taking control over your business’ organic rankings. Search engine optimization is something that should be on the forefront of every business owner’s mind, and that’s especially true if there has ever been a bad review, negative article or any other type of reputation-damaging press about your business. If there is any less-than-glowing press out there about your business, the last thing you want is for it to show up among the first organic search results when someone searches for your business on Google or Bing. You want your website, your Facebook page and the other channels that are in your control to show up first so that you have a chance to put your best foot forward with your audience. But in order to do that, you have to have a consistent, powerful search engine optimization strategy in place. Mistake #4. Putting your business’ online reputation in the wrong hands. The importance of a strong online reputation cannot be understated, and that’s true no matter what size of business it is or what industry it’s in. However, many business owners don’t understand just how important their business’ online reputation is, and they entrust it to an intern trying to earn college credits or a junior staff member who seems young and tech-savvy but has no real experience. This is a mistake that could end up doing a lot more damage than you ever thought possible. If your reputation manager doesn’t know what they’re doing or understand the importance of why they’re doing it, you may end up losing existing and prospective customers alike. Mistake #5. Posting fake reviews. A lot of companies make the mistake of posting fake reviews. Some of these reviews are falsely negative with the aim of making competitors looks bad, which is not only unethical and seriously underhanded, but also considered to be fraud by law enforcement and could lead to fees and legal consequences. Others might be falsely positive with the aim of making service look better than it really is, or that clients are happier than they really are. Customers can often see through fake positive reviews, and it automatically sends the message that something must be wrong with your service if you’ll resort to lying about it. And believe it or not, posting fake positive reviews about your own business could also land you in legal murkiness that’s best avoided. 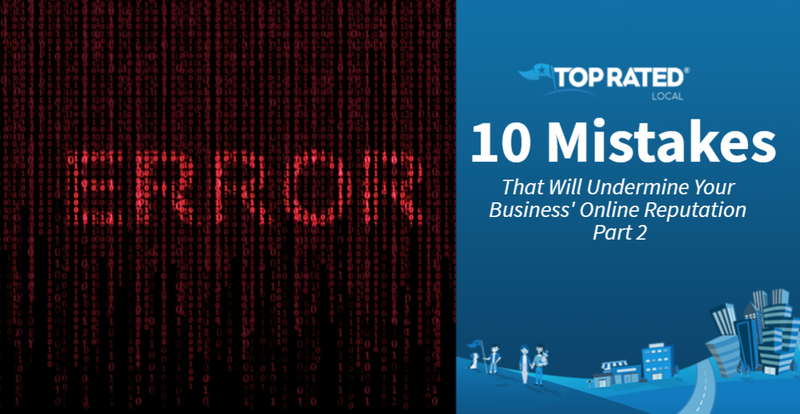 In our next blog, we’ll be touching on five more mistakes that will undermine your business’ online reputation. Stay tuned for our next blog to learn more. In the meantime, if you’re ready to take more control over your business’ online reputation, sign up for Top Rated Local today! Everybody loves to be rewarded for their actions — especially when that reward is a chance to win something cool or get some sort of discount. For businesses, reward and incentive programs are an incredibly useful tool in soliciting online reviews. Many businesses choose to offer things, like free shipping, raffle entries, and promo codes or coupons for discounts ranging from 10 to 50 percent to those who choose to leave reviews. The best part about the reward program tactic is that it really shows your customers that you value their feedback, be it overwhelmingly positive or simply constructive. Participating in events around your local community is great for business. Being active in your community can not only bring in more business but also helps to get your business reviews. The key to success is to participate in the right community events. For example, your funeral home business may not want to advertise or ask for reviews at a high school football game. However, for a printing company, this might be a perfect opportunity to hand out free signs in support of the team with a prompt for reviews on the back. It’s all about finding what fits for you and your business. We’ve all been there — you buy something online or even in person, and a week and 10,000 “how did we do?” emails later, you’re hitting the spam button (and in all likelihood, never shopping there again). You wouldn’t accept this kind of behavior from a friend or a partner, so why would you accept it from a business? Don’t be the kind of business that overwhelms their customers just to get reviews. You want to remind your customers that you’re there, without begging for their reviews. We recommend gathering phone numbers and/or email addresses and sending out one review message (either email or SMS) per transaction. No matter who you are or how well your business is doing, there are sure to be things that can be improved upon. If you’re getting the influx of reviews you want, chances are, not all of them are going to be overwhelmingly positive. Some may have some valuable feedback that you can build upon. In fact, growing in accordance to that feedback can make it so that future reviews are substantially more positive. After all, if one customer notices an issue, in all likelihood, others have too. You don’t want these issues to continue harming your online reputation. This one takes it all the way back to preschool, where you learned to say “please” and “thank you”. Sending thank you messages after reviews encourages people you serve to continue updating every time they have a great experience with you. It will also show them how much you really do appreciate the effort they put into showing their appreciation and helping you better your business. Made to benefit both businesses and the consumer, Top Rated Local captures experience ratings from a wide range of review sources. This gives you a clear snapshot of your online reputation, as well as a numerical Rating Score™ that provides you with an idea as to how you’re doing overall. A useful tool for any business, Top Rated Local bases its ratings on the five pillars of quality, satisfaction, value, experience, and timelessness. See what this simple, yet useful feedback can do for your business by claiming your profile today. Perception is a very powerful thing. The old adage about perception has never been more true: “Perception is reality.” In essence, this saying means that what someone believes is what’s real to them, no matter if it reflects reality or not. For example, even if the sun is shining and there are no clouds in sight, the man who believes it’s raining will use an umbrella. This fact has major consequences for businesses who rely on the internet for new customers, which let’s face it, describes most businesses. With online reviews, perceptions are made public. People think of perception as mainly an inward thing, and it largely is, but with the internet, and more specifically online reviews, people’s inward perceptions about local businesses are being made public more and more. You’re a roofer who specializes in installing metal roofs. Metal roofs are more expensive than many other types of roofing systems, but they also last longer than most other types and require less maintenance, making them a value for customers. Let’s say you installed a roof for an uninformed customer. They chose to go with a metal roof because they liked the way it looked or preferred a low-maintenance option, but they weren’t happy with how much it cost them and didn’t fully understand the added benefit of the longevity of the roof. Said customer then goes onto Yelp or Google to tell the world about how you charged them an arm and a leg for their roof. Without any other context, prospective customers might believe that you swindle your clients out of money by charging them higher-than-average prices, and that particular perception could end up losing your business. How to change the perception of your business online. Luckily, one bad review won’t destroy your online reputation, but that doesn’t mean that you should let it go by the wayside. If you fail to control the situation, prospective customers could read the review, believe it and choose not to utilize your services because of it; in essence, the perception of the unhappy reviewer could easily become the perception of the prospective customer. Get listed – In order for your side of the story to be the one prospective customers sees and believes, instead of the one unhappy customers paint, you must get your website listed and claim accounts on review sites. This will ensure that you control the conversation, and it gives you the ability to respond to commenters. Respond to negative reviews – Always respond to your reviews, but especially to negative reviews. If your business dropped the ball or made a mistake, apologize, own up to the mistake and offer to redo the work for free or make it right in some other way. If the customer overacted to a minor problem or unavoidable inconvenience, you can kindly and professionally help to set the record straight in your response. And if you don’t believe that the review is legitimate, you can let the world know. Gain more visibility – If there are articles, reviews or other things out there dragging down the perception of your business online, you may not be able to publicly respond to all of them or get them taken down, but you can help to push negative press about your business further and further down the search results. The best way to do this is by increasing the number of results that you can control or that show you in a more positive light. This is done by adding new pages and articles to your website regularly, posting on social media, sending out press releases, publishing videos on Youtube, etc. Sign your business up for Top Rated Local to start changing the perception about your business. In this day and age, the phrase, “Perception is reality,” has never been more true. Don’t let a negative perception cost you customers or prevent you from getting new ones. Take the first step toward controlling the conversation and changing the perception about your business by signing your business up for Top Rated Local today. It’s free to sign up, so you have nothing to lose. Get started today! The year that was 2018 is finally over. Like any other year, 2018 had plenty of ups and downs, and plenty of breakthroughs and obstacles. It was the year when Cardi B’s “I Like It” reigned supreme and The Avengers Infinity Wars” dominated the box office. It was also the year that we learned even more about reputation management. #1. Search engine optimization (SEO) is an essential part of reputation management. A lot of business owners think that reputation management revolves around responding to reviews, and while this is certainly a critical piece in the puzzle, you’re going to miss a lot of opportunities if you don’t focus on the SEO of your website. Managing your website’s SEO is a key part of reputation management because it gives you more control over what current and prospective customers see when they search for your company on search engines, like Google or Bing. If your customers are inundated with bad reviews and negative press at the top of their search results when they google your company, it sends the wrong message and will have them running the other direction. But when you make SEO a priority, you can focus on publishing new articles, social media posts, press releases, etc. that will push negative press further and further down the search results. #2. Bad reviews can be a good thing for your business. Some business owners think bad reviews are the end of the world, and while it may not be fun to receive bad reviews, it’s not as detrimental as you may think for your business. Believe it or not, bad reviews can actually be a good thing for your business in many different ways. For one, bad reviews make you appear more legitimate to prospective customers. Customers are suspect of businesses that only receive five-star reviews because they know that everyone is human and, therefore, makes mistakes. One bad review in a sea of good reviews shows customers your humanity, but it also shows them that you do your best to provide great service every time. Another reason why bad reviews can be positive is that they increase the overall number of reviews you have. If you have all five-star reviews, but there are only four of them total, it’s not all that impressive. When customers research new companies to work with, they not only look at the average rating of reviews the company has, but also the number of reviews. #3. Respond to both positive and negative reviews. 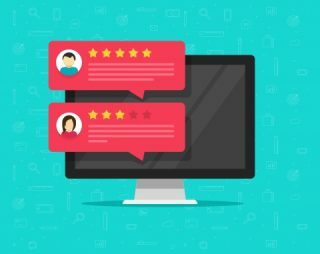 As we mentioned earlier, responding to your reviews is a very important part of successfully managing your online reputation. Not only does this mean that you should thank customers who leave you positive reviews, but it also means that you should follow up with customers who leave negative reviews. Responding to a negative review restores the power to you, the business owner, because it allows you to address concerns and show off your customer service skills. If you own up to the issue, apologize and offer to make it right, you may regain the trust of a customer who was offended or annoyed, and you may even win over prospective customers who want to work with an honest company that will fix their mistakes. #4. Great customer service is a must. Regardless of the industry you work in, the market today can be an over-crowded place. If your business is like most, your competition is fierce, and there are many other businesses out there that offer similar products or services at a similar price point. This means that the only real way that you can set yourself apart — other than by drastically lowering your rates — is to provide the best customer service. A lot of what you do to manage your reputation happens online; however, it all starts with the kind of service you provide for your customers day in and day out. #5. Keep your emotions out of the equation. Whether you’re posting on social media, writing a blog or adding a page to your website, it’s imperative that you keep your content professional at all times. This message is often confused, because in order to make an impact on your customers, it’s crucial to connect with them, and that is often done through messaging and advertising designed to tug at the heartstrings. There’s a very big difference, however, in sharing an emotional story about how your product or service helped to change someone’s life than it is to rant on your business’ Twitter account about how you’re sick of working with customers who don’t appreciate the work you provide, or than it is to write a scathing reply to a negative review. Keep your opinions and emotions to yourself when you’re representing your business. The world is a big, diverse place with people who all have different cultures, histories and religions. Don’t assume that your customers will agree with you, and don’t turn off prospective customers by allowing your emotions to take hold of you. #6. Learn from customer feedback. Reviews are great for so many reasons. For one, they allow your customers’ voices to be heard, making them feel empowered and listened to. Another reason why reviews are great is that they help prospective customers learn more about the businesses they are thinking of working with, giving them insight into the kind of service they can expect. And yet another reason why reviews are valuable is the incredible feedback they provide for businesses. If you’re interested in providing the best possible service for your customers, you can learn a lot about how to do so by reading your customer reviews. If you have a lot of positive reviews, you can pinpoint the areas that you’re exceeding expectations, and you can highlight those things on your website along with the positive reviews. On the other hand, if you have a lot of negative reviews, you can learn about the areas of your service that require improvement. Whether that means changing the expectations you set with your customers, switching up your team or giving your staff further training, negative reviews give you the information you need to provide better service for your customers. It would be great if every customer that had a good experience would go out and write a positive review for your company on their own, but that’s just not how things work. As we learned in an earlier point, people are much more likely to share a bad experience than a good experience, which means that good service is often not incentive enough to get your customers to leave reviews. Contrary to what many business owners think, there’s absolutely no shame in asking your clients for reviews, or even in incentivizing them to write reviews with discounts and giveaways. Even a simple, follow-up email that automatically gets sent to customers after their service or transaction has been completed can make a big difference in the number of reviews you get. Start 2019 the right way by learning 2018’s most valuable reputation management lessons! Last year may have been full of ups and downs, but it was a great year for learning valuable lessons about reputation management. Don’t let last year’s lessons fall by the wayside. Take them and learn from them, so that your business can find the success it needs to thrive in 2019. In addition taking the lessons learned in 2018 to heart, one of the best things you can do for your business’ reputation is to sign up for Top Rated Local. We track, rank and score business from a variety of industries, giving businesses more control over their reputation and customers more insight into the businesses they are thinking of working with. Best of all, it’s free to sign up, so do so today! Top Rated Local® is pleased to announce that, due to their wonderful 94.29 Rating Score™, Qualls ChemDry Salt Lake City’s go-to carpet cleaner! Are your carpets looking a little worse for the wear? If so, there’s no better carpet cleaning company to turn to in Salt Lake City than Qualls ChemDry! 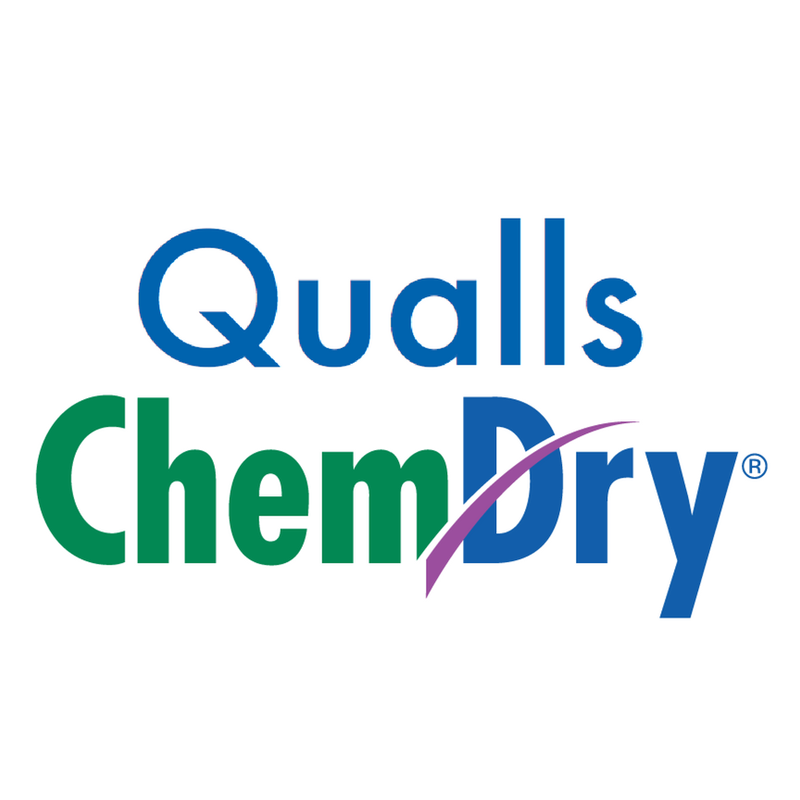 Qualls ChemDry has earned hundreds of online reviews with an average rating of 4.83 stars and an impressive Rating Score™ of 94.29. There are many things that set Qualls ChemDry apart from other carpet cleaning companies in Utah, but according to the owner, Kristy Qualls, it’s their name and their product that make the biggest difference. With chemical-free, green-certified carpet cleaning products, the expert technicians at Qualls ChemDry are able to lift embedded dirt and sediment deep within their customers’ carpets, making them look like new. Kristy attributes her company’s strong online reputation to her team’s commitment to providing quality service for each and every client. When combined with the pride the team takes in their name and products, that next-level service has naturally led to reviews from happy clients. In addition to the growth they’ve seen from having a powerful online reputation, Kristy has grown Qualls ChemDry through word of mouth and online advertising. Thank you so much, Kristy, for taking the time to speak with us, and congratulations to the team at Qualls ChemDry for their excellent online reputation! If you’re in need of carpet cleaning Salt Lake City, we highly recommend Qualls ChemDry. Visit their site today! Customer sentiment is something that all businesses need to be aware of. Believe it or not, emotions play a big role in customers’ decisions, and customer sentiment is the emotion that triggers customer engagement. For example, when a customer feels loyalty to a business, they’ll buy more of their products or use more of their services, and they may even refer the company to their friends and family. On the other hand, when a customer feels dissatisfied with a service or product, they’ll often express their feelings both online and offline in the form of negative reviews and word of mouth. Whether a customer is making a purchase, writing a review or telling a family member or a friend about a business, all of these actions are the result of their emotions — otherwise called customer sentiment. Customer sentiment covers a wide range of emotions, from satisfaction, loyalty and excitement to indifference, dissatisfaction and even anger. Regardless of whether your customers absolutely adore your brand or can’t stand it, it’s incredibly important that you understand what their emotional state is, but even more importantly, it’s essential that you understand what’s driving that emotional state. 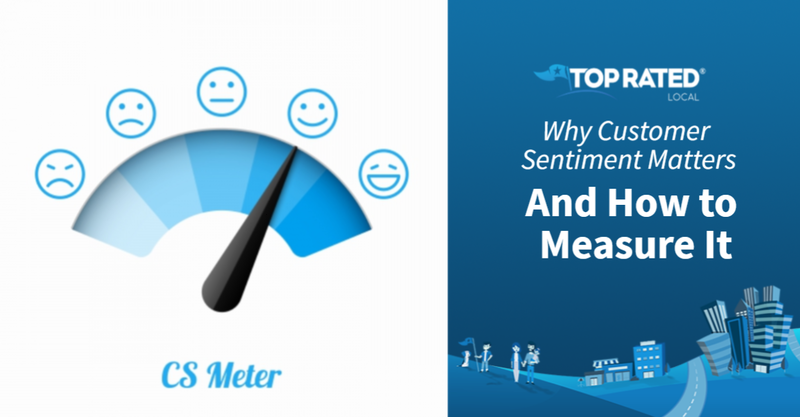 Why it’s important to measure customer sentiment. When you’re able to measure how your customers feel when they interact with your brand or business, you’ll gain an understanding of what you do that leads to satisfied customers and what you do that your customers aren’t as thrilled about. Understanding what your customers are feeling and why will help you develop solutions that lead to more loyalty, and you’ll also be able to proactively repair any issues that may be hurting customer sentiment. It helps you establish realistic expectations, sets a benchmark for future success and reveals opportunities to improve the service you provide for your customers. Furthermore, it gives you insight into how likely your customers are to refer your business to a friend and use your services or product in the future. How to measure customer sentiment. Today, the vast majority of advertisements are done online, but that doesn’t mean that word of mouth is dead. Surprisingly enough, word of mouth is still, hands down, the most effective way to gain new customers. However, measuring the willingness of your customers to refer you to their friends and family isn’t something you can do with an online tool or an app. In fact, the easiest and most straightforward way to measure this metric is to actually ask your customers directly. Survey your customers, asking them how likely they would be to recommend your business to a friend or colleague on a scale from zero to 10. Customers who answer with a nine or a 10 are considered Promoters; customers who answer with a zero through six are Detractors; customers who answer with a seven or eight are Passives. To calculate your results, you’ll take the percentage of Promoters subtracted by the percent of Detractors — and you’ll leave out the passives. The higher the score, the more likely your customers are to refer your business. Reviews are probably the most straightforward way to gauge how your customers are feeling about your goods or services. That’s why it’s essential that you 1) claim your business listings on review sites, 2) actually read your reviews and 3) respond to those reviews. Responding to reviews, even if they’re negative — and especially if they’re negative — can help to turn around those negative emotions and make your clients feel heard. When you’re able to turn around a bad experience and demonstrate to a customer how much you value their feedback and service, it creates a new level of loyalty and helps you earn customers for life. Another great way to measure customer sentiment is to simply talk to your employees that work with customers on a daily basis. Not every customer will be 100-percent honest with your employees about how they feel or how satisfied they are, but most customers are pretty straightforward, especially if their experience was particularly positive or negative. Furthermore, your customer-facing employees know when they’ve had positive or negative interactions with customers, even if the customers don’t always come right out and tell them. Velocity of Comments – How many people are talking about your brand and how quickly is the conversation moving? Tone of Comments – Not only is it important to know the velocity of comments, it’s absolutely essential to know the tone of those comments. Is the tone of the comments regarding your brand positive or negative? Shares or Mentions – Does your brand get a lot of shares or mentions? Have your shares or mentions increased or decreased with changes to your campaign or with the release of new products or services? Reactions – When people react to your brand on social media, what emotions do they share? Start taking control over your online reputation with Top Rated Local®. Customer sentiment is just one aspect of your business’s online reputation, and it’s an incredibly important aspect to keep a diligent eye on. Top Rated Local was developed to solve common problems that businesses face, like fake reviews, false, slanderous comments, interference from competitors, blackmail and more, and the best part is that it’s 100-percent free to sign up! Get started today! In this day and age, it’s essential for every business to manage its online reputation effectively. It used to be that a business’s reputation was mostly word of mouth, but today, that reputation is largely online. For businesses that are doing it right, this is a great thing, because it makes them stand out and allows them to get more exposure. But for businesses who aren’t taking steps to manage their reputation, there’s a lot at stake. #6. Focus on providing great customer service. There is a lot of competition out there, and that’s true regardless of what industry your business is in. With so many businesses offering similar products and services for around the same cost, the thing that makes one business stand out among the rest is the kind of service they provide. Great customer service is something that benefits your reputation as a whole, both online and offline. Providing exceptional customer service won’t guarantee that you’ll only get five-star reviews. There may still be a select, few, rogue clients that may leave negative reviews, but in general, the reviews you get will reflect the service you offer. When your clients are genuinely happy with the service you provide, more than likely, they’ll leave a positive review, especially if you ask them to. #7. Use negative feedback to improve your business. In some cases, a bad review may criticize something that’s completely out of your control, blown out of proportion or downright made up. However, the majority of the negative reviews companies receive are based on real issues. And if one of your customers experienced an issue, chances are, other customers in the future will also experience that issue if it’s not taken care of. The best way to deal with negative feedback is to really listen to it and learn from it. If you can correct the issues, not only will it help to turn around the experience of that individual customer who left the negative review, but it will also ensure better service for future customers, ensuring a better all-around reputation for your business. No one wants to receive negative feedback, but if it helps you provide better service for your customers and improve your reputation, it can be a very positive thing. #8. Respond to reviews, especially negative ones. When a customer leaves a review, it’s important to respond. And this is especially true when a customer leaves a negative review. When you respond to your reviews, it shows your customers the human side of your business. Responding to positive reviews demonstrates to your customers that you value the fact that they took the time to leave you a review, and responding to negative reviews demonstrates that you actually care about the customer’s feedback enough to respond to it. #9. Respond to negative reviews the right way. Don’t argue with the customer – Whatever you do, don’t argue with the client about their review in your response. You’ll only end up making yourself look petty and hurting your business’s online reputation even more. If you disagree with the customer’s feedback or want to explain your side of the story in more detail to the customer, invite them to email you or call you to discuss the matter more privately. Apologize to the customer – First and foremost, you should always apologize when a customer has had a bad experience, whether you deem their feedback fair or not. Offering a real and transparent apology will help to pave the way for diffusing the situation more effectively than anything else. Make it right – Once you’ve acknowledged the problem and apologized for it, you now need to figure out how you’ll make it right. Whether that means offering future discounts, redoing the work for free or anything else is up to you. But no matter what, it’s always important to take steps to make a negative experience right, especially when you know that the world is watching! #10. Invest in your reputation. As you can tell from this article, there are many different aspects of reputation management, including your website’s organic rankings, your social media engagement and so much more. 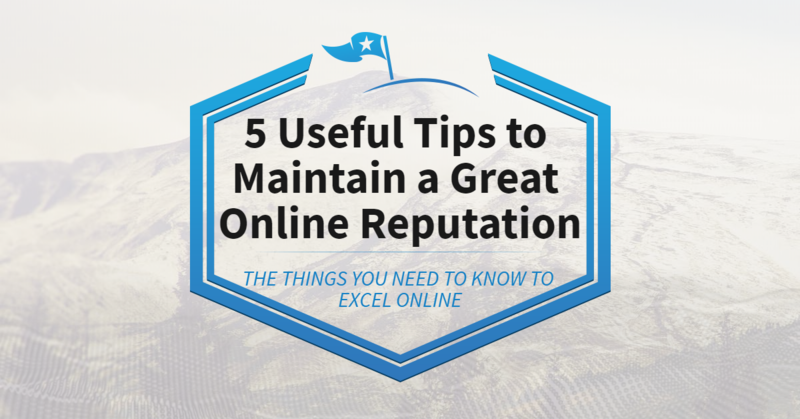 Staying on top of your online reputation is a big job that takes a lot of time and energy. If you don’t have the bandwidth for a dedicated reputation management expert on your staff, or you don’t have the time to fully manage your business’s online reputation yourself, it’s time to invest in professional reputation management. This is incredibly important if your business’s reputation is particularly bad or tricky. Your business’s online reputation is not something that should be taken lightly or put on the back burner. That reputation can make or break your business, and if you want your business to grow and prosper, you need to make a real investment of your time and money into it. Are you ready to start taking control over your business’s online reputation? If so, take the first step toward effective online reputation management by signing your business up for Top Rated Local® today! Top Rated Local is free to join, and it’s a great option if you’re hoping to rank for more of those “near me” searches. Sign up today!